With the football season almost finished, the Movies, Films and Flix crew have compiled a list of potential teams that could make next season much more entertaining. We encourage you to join the fun! Chime in and let me know who I left out or who you’d put on a team. Below is a scouting report for the Horror Sqaud. Coach: Hannibal Lector-Criminal mastermind and manipulator. The man eluded police for years and could easily inspire a team of murders, ghosts and Demons. Negatives: Keep him away from interns and fava beans. 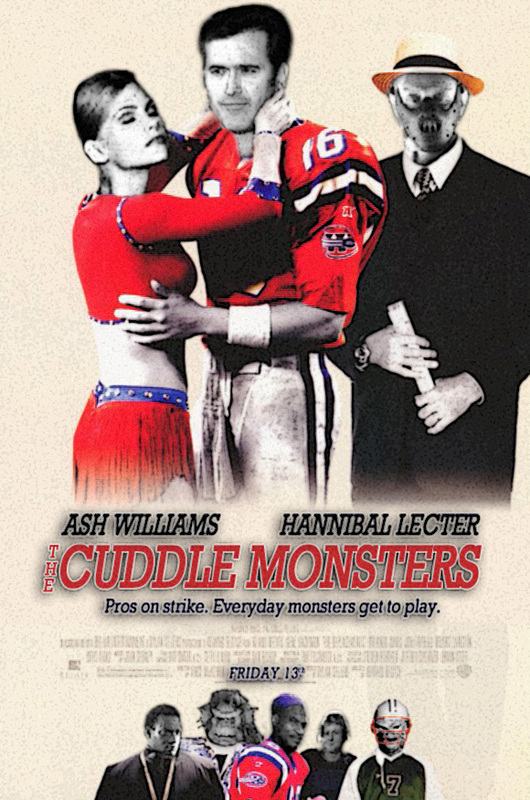 Assistant Coach: Bughuul (Sinister) – No opposing team would dare watch The Cuddle Monster’s game tape. Negatives: Don’t watch the wrong game tape. He might steal your children. Offensive Coordinator: Jigsaw – Imagine the plays and schematics he could draw up. Defensive Coordinator: Freddy Kreuger-He can “dream” up amazing plays. Plus the other team won’t want to sleep the night before. League rules won’t allow him to kill people – just disrupt their sleep cycles. Negatives: Exists in a dream world. Medic: Dr. Giggles: the Only man creepy enough to stitch up Leatherface. Negatives: Movie flopped….still bitter… and his massages are a little rough. Trainer: Buffalo Bill-He can put the lotion on the bodies of players. QB: Ash from the Evil Dead series-The dude has been hit by everything and still keeps going. Plus, Evil Ash will be his back-up QB. Also, his intimate knowledge of the shotgun makes him great in the shotgun formation. Negatives: Easily forgets plays, and his chin has trouble fitting in the strap. Running back: Dracula-Bat, wolf, old, smart and fast. There is no tape on him because he doesn’t show up on film. Negatives: Can only play night games. Backup running back-Jamie Lee Curtis from Halloween-She ran from Michael Myers for twenty years. I can’t imagine anybody catching her. Negatives: Stays in the game too long…ends up in bad sequels. Fullback-Leatherface-If you need two yards on fourth down he will get them with his crazy redneck strength. Negatives: Cannibal….always complains at dinner functions. Wide Receiver: Creature from The Descent – the thing hangs on walls – imagine it catching a football. Negatives-Always needs a visor and has to stay away from female spelunkers. Wide Receiver: Pennywise – clown from It – Nobody will want to cover him. The dude is a freaky clown who can turn into a spider. Negatives: It’s nearly impossible to find clown shoe cleats. OT: Troll from Ernest Scared Stupid – Dude is a brick shithouse. Can pull a truck and run fast. Perfect if he has to pull. Negatives: Keep him away from milk. Will never block a field goal. OT: Sack Head dude from the 3D Resident Evil film – Every O-line needs the tatted up big dude. It worked for Kyle Turley. Negative: He has a huge nail through his head which makes him deaf. Many false starts. OG: Jason Voorhees – Slow moving but a wall. Very durable and very few false starts. Negatives: Slow yet somehow fast. Not team player. Cannot defend the swim move. OG: The fog from The Fog – you have no choice but to run around the fog or get sucked in. Plus there are thousands of people in there. Many hands to block. Negative: With many hands come many hands to the face penalties. Center: Nathan Fillion – Slither – He has so much muscle mass he can’t get drunk. Plus, nobody has heard of him. Negatives: Almost goes out of his way to get hurt. Tight End: Candy Man – Can run great “hook” (hey oooohh) patterns and incites fear in referees who rarely call him for a fifth penalty. Negatives: You need a whole lot of footballs when he is playing. Also, he only has one hand. Erin Harson – You’re Next – She is the Wes Welker of horror movies. Smart, thrifty, and impossible to conspire against. Negatives: Her bangs might not work in the helmet. Negatives: Michael J. Fox defeated him. DT: The Blob – Takes up incredible amounts of real estate. Negatives: Molasses makes fun of him. DE: Creature from the black lagoon – he knows the swim move. Can get around defense. Negatives: Constantly needs water…Hogs the ice pool. DT: Bubba Ho-Tep – His only kryptonite is Old Elvis. Plus he can graffiti great smack talk. Negatives: Doesn’t have the guts to make big plays. Negatives: He always tries to make people put on glasses. MLB: David Keith from They Live – Knows Russell and Piper. Dude can take a beating and still survive. He is the only man to stand tough in massive brawls and survive a shape shifting creature. Negatives: Always a supporting character. Isn’t flashy. Solid numbers every year. RLB: Kurt Russell from The Thing – Reads people well and survives monster attacks. The guy was the last person standing in Antarctica against a crazy alien. He could pretty much tackle anything. Great hair! Negatives: Duh….he’s Kurt Russel, bro! S: Michael Myers from Halloween–No matter how far away you think he is when you turn around he will be right behind you. Negatives: Never talks, Might stab you, Can never repeat classic plays. S: Demon from Paranormal activity – Interception machine. You can’t see him. Gets away with a lot of tugging and grabbing. Negatives: can actually say that he is from hell. Not personable. Corner: Rage infected person from 28 Days Later – If the dude wants to get to the ball, he will get to the ball. Nobody wants to get infected blood spit on them. Luckily, the league found a cure. Negatives: MANY MANY MANY MANY penalties. Corner: Invisible man – Good luck QB. Can’t read defense when you can’t see them. Negatives: Kind of a perv. Watches cheerleaders during the game. Kicker/Punter: Bigfoot – Huge foot. Negatives: Jokes are too easy. Waterboy: Stripe from Gremlins: Intelligent, solid leader and can spawn thousands of Gremlins to run a cheap labor force. Negatives: You will have to deal with shitloads of Gremlins. Wolfman: Plays only once a month. Chucky: It’s a bad thing when the demon from Paranormal Activity and the clown from It are creeped out by you. The Blair Witch-She is great at cornering people. The Leprachaun-put a piece of gold on the footbal and no blocker will stop him. The Fisherman from I Know What You Did Last Summer-He knows where people will run and is great at catching them. If Ash is the QB I’ll just have some evil hag-witch blitz him! Even though he always wins the fight, he won’t get the pass off before more pile on him. Now…if only I could trade a player for a witch. Or maybe I’ll use one of my Sci-Fi scientists to clone mini-Ashes! Again, he’ll win in the end, but not after a delay of game penalty as they tie him down Gulliver-style! The creature from The Descent would be legit, and really scary. Here’s an idea for a football team: Dolph Lundgren characters- a team comprised of his different characters from all of his movies! As Ash would say “Good, Bad, I’m the one with the gun.” Give it two delay of game penalties and ash will have it figured out. 2 Chucky – he’s quick and agile and wielding the ball in one hand and a knife in another he can be rather effective. 3 Gremlins? (perhaps a gaggle of gremlins would be allowed in place of one player since that’s how they roll. I foresee a lot of little green guys throwing laterals back-and-forth down the field, running in-between the legs of players, terrorizing the opponents and of course in some way…cheating).